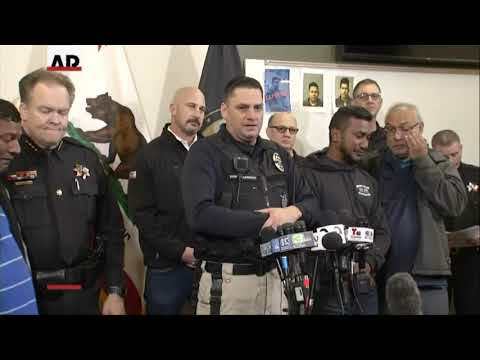 The sheriff leading the investigation blamed California’s sanctuary law for preventing local authorities from reporting Gustavo Perez Arriaga to U.S. immigration officials for two previous drunken driving arrests. If he had been deported, the sheriff said, Cpl. Ronil Singh of the tiny Newman Police Department would still be alive. As a SWAT team prepared to raid the house, Perez Arriaga came out with his hands up and surrendered. He was sent north in the slain officer’s handcuffs, Kern County Sheriff Donny Youngblood said. California’s sanctuary law limits cooperation between local authorities and U.S. immigration officials and has drawn scorn from the Trump administration. It includes more than 800 exceptions for violent crimes and felonies and bars police from asking people about their citizenship status. Former state Sen. Kevin de Leon, the Democrat who wrote the legislation, said it’s unfair to blame the law for the officer’s death. Christianson, who was at a meeting with Trump and slams California’s law in a video posted by the White House in May, said the measure prohibited his department from sharing Perez Arriaga’s gang ties, “other active warrants” and past DUI arrests with federal immigration authorities. He didn’t give details on the other warrants. “California law fully permits the sharing of information on dangerous gang members,” spokesman Evan Westrup said. Christianson called for stricter laws at a news conference Friday as Singh’s brother wept beside him. Authorities also arrested five other people, including Perez Arriaga’s brother, 25-year-old Adrian Virgen, and a co-worker, 32-year-old Erik Razo Quiroz, who lied to police to try to protect him, Christianson said. He said both men also were in the country illegally. “This is a man that loved his country. This is a man that worked hard for what he believed in. He believed in this community,” the chief said at a Friday night community vigil honoring the officer. Richard said Thursday that Singh, the department’s first officer to die in the line of duty, drove more than two hours each way to attend the police academy in Yuba City. He joined the Merced County sheriff’s office as a reserve officer and worked as an animal control officer in Turlock before being hired in Newman.